Congratulations! Your floor’s been installed, and it looks all shiny and new. Let’s keep it looking that way! Know what your flooring warranty covers and what it doesn’t. Follow the floor care instructions included with your warranty. 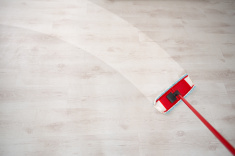 Cleaning laminate floors or hardwood floors usually requires cleaners that are specifically designed for those types of floors. First, use a dry mop, then follow the directions on the cleaner. Solid hardwood floors need to be sanded and refinished every 15-20 years. When moving large objects or furniture across a hardwood or laminate floor, protect the legs or bottom of the object to prevent scratches. Place padding or coasters under furniture legs to prevent indentations. Vinyl floors are easy to maintain – just mop with a floor cleaner when your floor starts to look dull. With any floor, spills need to be cleaned up immediately to prevent permanent staining. Now you’re ready to relax and enjoy your new floor. Just remember to protect it for years of lasting beauty!